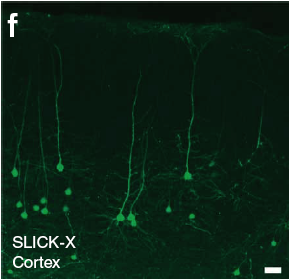 There is a nice writeup of the single-neuron labeling with inducible Cre-mediated knockout (SLICK) paper from Guoping Feng‘s lab over at the Alzheimer’s Research forum. The method simultaneously knocks out a gene in a small number of cells, while highlighting the knocked-out cells with a cytosolic fluorescent protein. In a comment to the Schizophrenia Research Forum, Joseph Gogos points out a similar technique his lab published last year in Current Biology. Also in the writeup is coverage of the new fluorescent protein variants from the Tsien Lab. These include mOrange2 made by Nathan Shaner, which is a much more photostable version of mOrange. This should immediately replace mOrange in most constructs. Also of note is TagRFP-T from Michael Lin and his trusty undergraduate assistant Michael McKeown. Tag-T is an extremely photostable derivative of the Evrogen protein TagRFP. Tag-T was discovered by screening Tag mutants in bacterial colonies on a solar simulator. Toxicity in sensitive cells (in vivo neurons) hasn’t been fully determined yet, but in vitro these new FPs all look great. Now I wish they would make a super-bleach resistant Citrine for my FRET constructs.